AT&T is currently in the process of rolling out its new deceivingly named “5G Evolution” service to its subscribers in the Indianapolis area. This new service has absolutely nothing to do with 5G technology and isn’t a representation of the next leap forward in that area, but it absolutely does mean that AT&T customers in Indianapolis should start seeing almost immediate increases in data speeds received on their devices, as long as that device offers support for this technology. AT&T’s 5G Evolution technology and service were announced as far back as April this year, so it’s most definitely something that subscribers have been expecting and waiting for. Rather than actually being an astronomical leap forward with the first 5G rollout, this is actually something that other carriers have been doing for a while under the real name of 4G LTE-A. Granted, 4G LTE-A doesn’t sound as wonderful as 5G Evolution, and it’s definitely not as marketable, but it’s a lot more realistic as an outline of what’s being offered here. AT&T’s original announcement of the service promised “carrier aggregation, 4×4 MIMO, 256 QAM and more,” which probably doesn’t actually mean a great deal to the average user, but in its barest form, it means that those in a compatible area, who subscribe to AT&T’s services, and who operate a compatible device, should start seeing those beautiful increased data speeds. The carrier itself mentioned Samsung’s Galaxy S8 and S8+ as compatible devices in its announcement, but anyone with a smartphone or tablet that has a modern chipset should also be able to benefit. The initial rollout in Indianapolis should be followed up by further expansion into 20 additional areas before the end of the current calendar year. The network has already highlighted San Francisco, Boston, Atlanta, Chicago, Los Angeles, and Nashville as confirmed receivers of the technology, but has also confirmed that additional announcements will be made in due course. 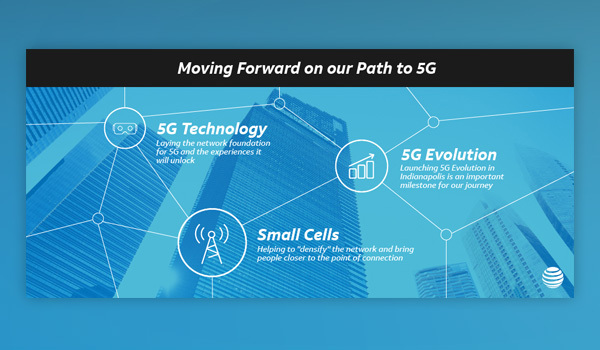 This definitely isn’t true 5G – as the final specs for that technology were only announced earlier this year – so we are a long way off seeing that actually happen, but this is a step forward for AT&T subscribers who will definitely benefit from the network improvement.